Israel 'Henry' Leibo was born into a Jewish family in Tallinn, Estionia in 1912 and started painting at the age of 8. He began training as a doctor, but in 1929, at the age of 18, abandoned medicine for painting and left Estonia for Berlin, where he studied under Max Liebermann. He moved to Paris in 1932, joining the circle around the Ecole de Paris juifs and exhibiting at the Petit Palais. In 1935 he exhibited in Riga, Latvia, and Copenhagen, Denmark (his portrait of the Danish King Christian earning his a lifetime's pension), and in 1937, at the invitation of the Belgian Colonial Office, he travelled extensively in the Congo. producing a body of around 80 works. In 1939 he arrived in England with Moise Kisling, after they were offered a joint exhibition at the Lefevre Gallery, London, and settled in London. 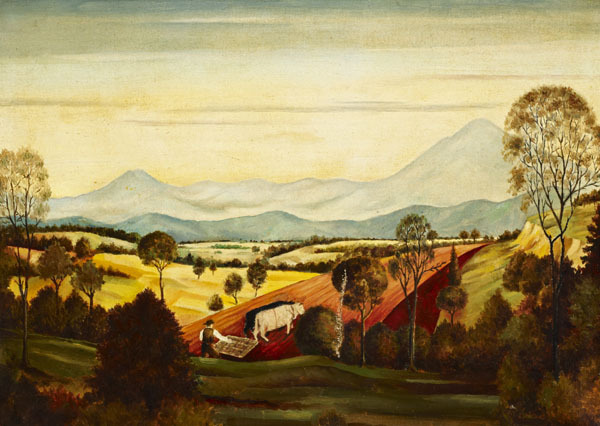 He also exhibited in Harley Street in 1976 at the premises of Dr Immanuel Bierer, who later presented his painting 'Landscape with Plough' to Ben Uri.